In 1927, an effort was made by the Fascist regime to unite all Roman clubs under the same banner, with Lazio being the only holdout. The merging of the other Roman clubs led to the foundation of AS Roma, and marked the beginning of a fierce inter-city rivalry. 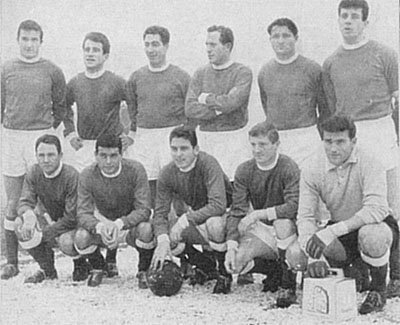 Lazio team in the 1960-1961 season. When SS Lazio was founded in 1900, its original founders settled on the team colors of white and sky blue in order to pay homage to Greece, the homeland of the Olympics. After some decades that didn't yield much success for SS Lazio, their first trophy came in 1958 (Coppa Italia). Yet, it didn't stop the club getting relegated to the second division only three years later. After a string of mediocre finishes in both Serie A and Serie B, Lazio managed to form a solid team led by Giuseppe Wilson and win their first Scudetto in 1974. In 1980, Lazio was relegated to the second division as punishment for their part in the Totonero scandal. The club remained on the margins until the arrival of Sergio Cragnotti in 1992. The new owner turned a new leaf and started investing into famous players like Juan Sebastian Veron, Christian Vieri and Hernan Crespo, whose $52 million signing broke the world transfer record. This shopping spree led to a streak of respectable finishes in Serie A, and the club finally managed to win its second Scudetto in 2000. The turn of the century proved to be a very successful period for the Biancocelesti, as they also won three Coppa Italia trophies (1998, 2000, 2004) and the final Cup Winners' Cup in 1999. 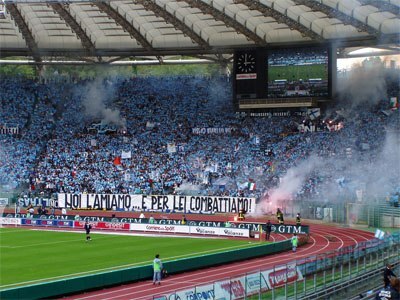 Lazio supporters at the Stadio Olimpico in 2007. After some failed big money signings and Cragnotti's forced departure in 2002, Lazio was forced to sell their star players in order to avoid bankruptcy. This was followed by a return to mediocrity, but the club did occasionally manage to rise above the expectations by winning two more Coppa Italia titles in 2009 and 2013. The badge of Lazio is characterized by the yellow eagle which refers to power and strength, especially associated to great ancient gods like the Greek Zeus and Roman Jupiter. The golden eagle would later be adopted as a symbol by the Italian Fascists, but as Lazio had used the symbol many years earlier where is no connection.